Hosei University Research Center for International Japanese Studies | EToS’ Research Meeting “Edo-Tokyo Seen from Art and Technology” Will Be Held on 27th July 2018. 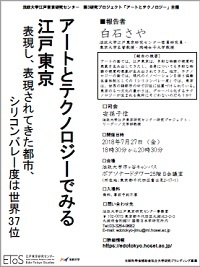 Hosei University Research Center for International Japanese Studies HOME > News > Fiscal Year 2018 > EToS’ Research Meeting “Edo-Tokyo Seen from Art and Technology” Will Be Held on 27th July 2018. EToS’ Research Meeting “Edo-Tokyo Seen from Art and Technology” Will Be Held on 27th July 2018. EToS’ Research Meeting “Edo-Tokyo Seen from Art and Technology” will be held at Hosei University on Friday, 27th July 2018. Speaker is Professor Dr. Saya Shiraishi of Okazaki Women’s University and the University of Tokyo and chair is Professor Shin Abiko of EToS.